Marsh Trail and Alternative Marsh Trail – Some dry spots, but puddles and stretches of several inches of water to a foot deep in places along the marsh edge. Oak Hammock Trail – One to 4 inches deep in places. Pine Flatwoods Trail – One to four inches deep in places. Campsite Gate 3 – needs 4-WD vehicle to access. Green and White Loops – completely under water, depth from one to 6 inches. Blue shortcut from Yellow to Green Loop – inundated with 3 to 6 inches of water. Yellow Loop – some dry patches, wet in low areas near seasonal ponds. All trails mowed on June 26th. Campsite – dry and accessible. Most of the trail is still dry. A few soft and wetter spots between map points 3 and 6. Of course, how wet the trails are depends on the frequency and amount of rain. A few days without and it’ll dry down. But as the ground gets saturated, even small rain events will fill the low spots with water. Either way – wet or dry, summer is abuzz with life on the trails. 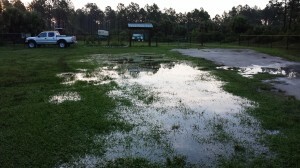 So , come get your feet wet and enjoy the essence of summer in the swamps and marshes of CREW!